In the era of the "social enterprise," collaborative activities can make a big difference not only in HR efficiency but in employee satisfaction. Take a look at these eight leading HR platforms and examples of what their collaboration features have done for other companies. 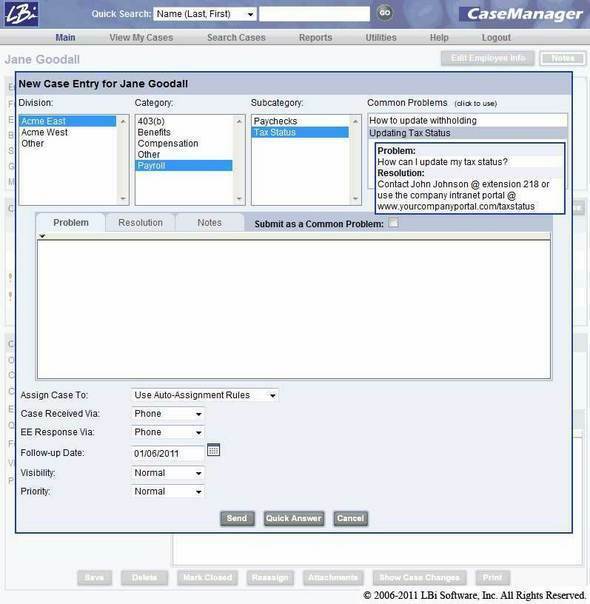 Among LBi Software's suite of offerings is CaseManager, a help desk and workflow management software. Besides handling the flow of help requests, CaseManager creates a knowledgebase out of successfully answered questions and provides employees with a self-service portal for getting their questions answered. LBi's largest client, a multibillion-dollar manufacturer--which will remain nameless--with more than 100,000 employees, uses CaseManager to route calls to the proper resource and manage interaction between HR and employees. "The customer wanted to reduce the number of calls into their help desk by letting employees get the answers themselves so the HR staff could work on other, more strategic tasks," says senior product manager Scott Tiedemann. "As new questions get submitted, they get logged and tracked through the workflow until they're resolved. The customer service representative can assign the questions to a specialist and escalate it to managers if necessary." The answer can also be added to the knowledgebase for quicker service later. "The customer reduced calls the help desk staff and recouped their investment in under two and a half years," says Tiedemann.